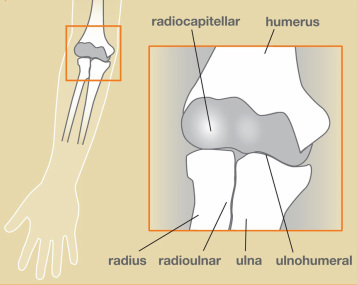 The elbow is a hinge joint comprised of three bones – humerus, radius and ulna (see Figure 1). Ligaments hold the bones together to provide stability to the joint. Muscles and tendons originate and insert onto the bones around the elbow to provide force to move the bones and perform activities. Elbow fracture may result from falling onto an outstretched arm, a direct impact to the elbow, or a twisting injury. Sprains, strains, or dislocations may occur at the same time as a fracture. Pain, swelling, bruising, and stiffness in and around the elbow suggest a possible elbow fracture. A snap or pop at the time of injury may be felt or heard. Skin openings may reflect communication between the bone and the outside environment. Visible deformity would indicate displacement of the bones or a dislocation of the elbow joint. It is always important to check for possible nerve and/or artery damage. X-rays are used to confirm if an elbow fracture is present and if the bones are displaced. Sometimes a CT scan might be necessary to get further detail, especially of the joint surface. Figure 1. The elbow joint. Stiffness is a major concern after any elbow fracture. Treatment is therefore focused on maximizing early motion. Conservative treatment (sling, cast) is usually used when the bones are at low risk of moving out of place, or when the position of the bones is acceptable. Age is also an important factor when treating elbow fractures. Casts are used frequently in children, as their risk of developing stiffness is small; however, in an adult, elbow stiffness is much more likely. Elbow fractures that are displaced or unstable are more likely to need surgery to realign and stabilize the fragments, or sometimes to remove bone fragments, and ideally allow for early motion. Whenever an elbow fracture is open (skin broken over the fracture), urgent surgery is needed to clean out the tract and bone so as to minimize the risk of a deep infection. Therapy is often utilized to maximize motion. This might include exercises, scar massage, modalities such as ultrasound, heat, ice, etc., and splints that stretch the joint (static progressive or dynamic splints). Pain is usually worse with forearm rotation. It is critical to detect the presence of a mechanical blockage of motion from displaced elbow fracture fragments. The specific type of treatment depends on the number and size of the fragments. Non-displaced elbow fracture is treated with early motion. Complex elbow fracture often requires surgery to repair and stabilize the fragments, or to remove the radial head if the fragmentation is too severe, or occasionally to replace the radial head. Like the radial head fracture, the radial neck fracture causes pain, which is worse with forearm rotation. 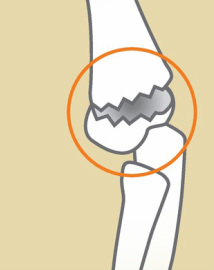 The type of treatment depends on the number and size of the fracture fragments. Radial neck fracture is treated with bracing and early motion. Complex radial neck fracture requires surgery (see Figure 2) . Figure 2. 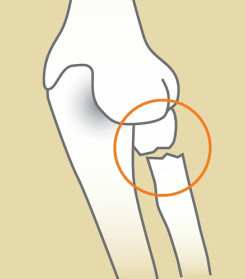 Illustration of radial neck fracture. Stable olecranon fracture can be initially treated with splint immobilization, followed by gradual motion exercises. Severely displaced or unstable olecranon fracture requires surgery. The bone fragments are re-aligned and held together with pins and wires, or plates and screws (see Figure 3). Distal humerus fracture occurs commonly in children and in the elderly. Nerve and/or artery injuries can be associated with these types of fractures and must be carefully checked for. These fractures usually need surgery, except for those that are minimally or non-displaced, stable, and have no associated nerve or artery injury (see Figure 4). Figure 3. 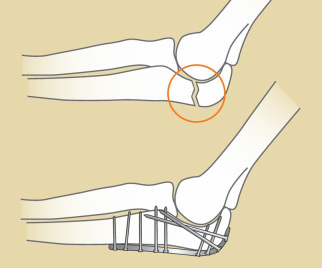 Illustration showing an olecranon fracture and repair. Figure 4. Displaced supracondylar humerus fracture in a child.